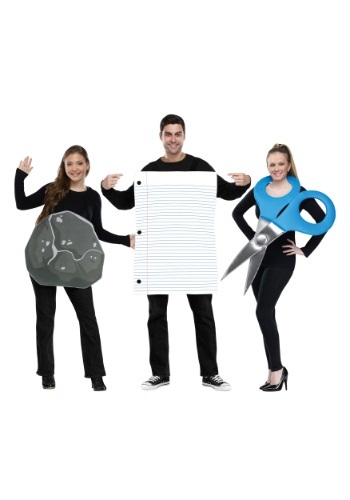 Rock, Paper, Scissors Adult Costume By: Fun World for the 2015 Costume season. It's a simple game, and an ancient one, that originated in Asia nearly two millennia ago. You and two friends can play the game with this Rock, Paper, Scissors Adult Costume. You get three complete costumes in the same package, for one low price. It's quick and easy, too, and you can just wear it over ordinary clothes. Now that's a costume solution that sounds like a winner (even if your friends know you always throw rock).